Pellegrino Tibaldi (1527-1596), Neptune, from the Story of Ulysses (1549-51), fresco, dimensions not known, Palazzo Poggi, Bologna, Italy. Original source unknown. 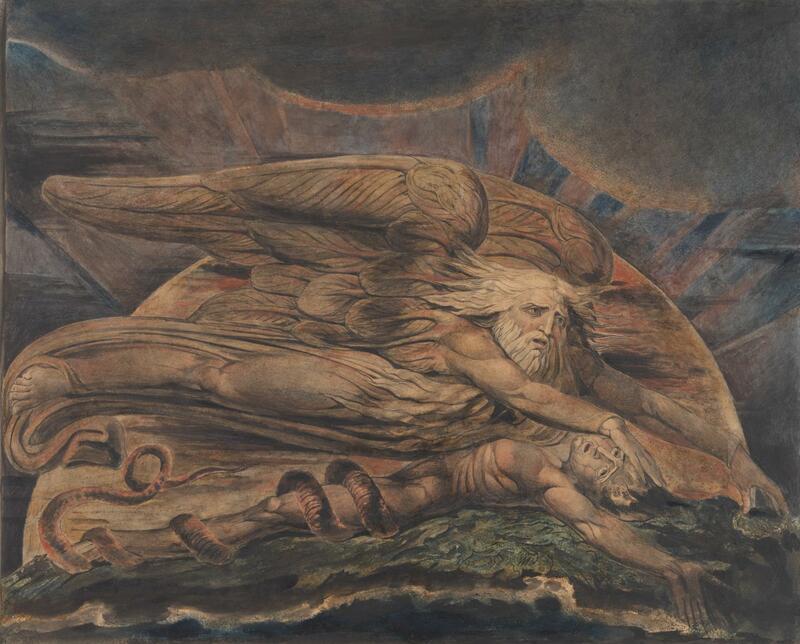 If we should read Blake’s writings in order to better read his paintings, is that sufficient? In the introductory article to this series, I took Blake’s painted etching The Ancient of Days (c 1821) as an example which can easily mislead, and here consider its origins and references in more detail. William Blake (1757–1827), The Ancient of Days (c 1821), etching, Indian ink, watercolor and gouache on paper, 23.2 × 17 cm, Whitworth Art Gallery, Manchester University, Manchester, England. Wikimedia Commons. Its central features are the figure, which is accepted as being Urizen from Blake’s personal mythology, and a pair of dividers or compasses. The latter are an attribute of Urizen as an architect, and have a long tradition in visual representations of god-like figures, particularly those who are creators. Anonymous, God the Architect of the Universe (c 1220-1230), frontispiece to a Bible Moralisée, illumination on parchment, 34.4 × 26 cm, Österreichische Nationalbibliothek, Vienna, Austria. Wikimedia Commons. 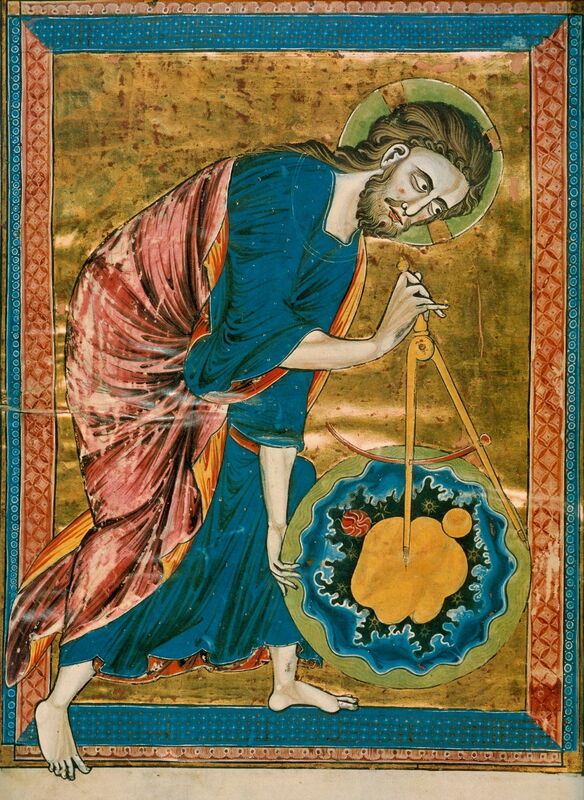 This frontispiece to a Bible Moralisée from around 1220-30 shows the Christian God as architect, using his compasses during the creation of the world. The compasses continue in various modern symbols, including those which feature in freemasonry, and in its references to the Supreme Being as the Great Architect of the Universe. The figure has been analysed in detail by Blunt. Urizen typically appears with long and streaming white hair and beard, and this is demonstrated in Blake’s plates throughout his First Book of Urizen from 1796. 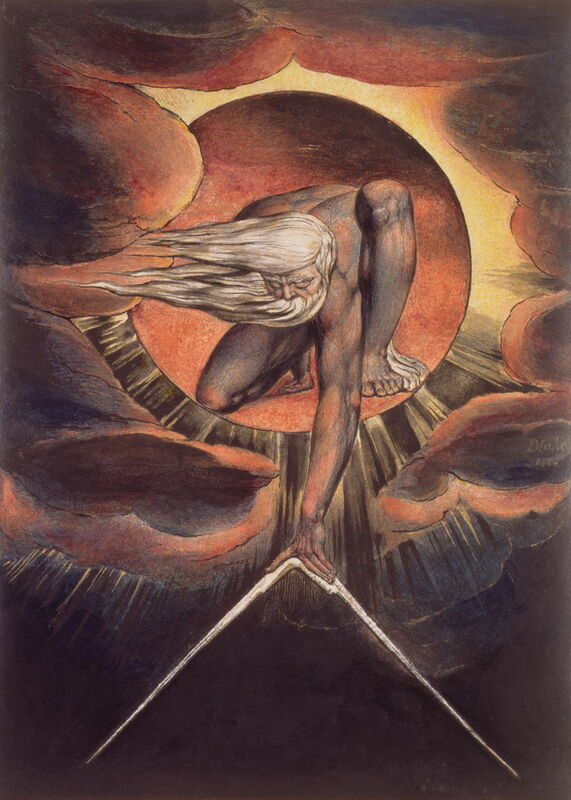 But Urizen is not the only figure from Blake’s mythology who has long white hair and beard: above is Elohim Creating Adam from 1795, for example. William Blake (1757–1827), God Judging Adam (c 1795, c 1804-05), colour relief etching with additions in pen and ink and watercolor on paper, 42.1 x 52.1 cm, The Philadelphia Museum of Art (Gift of Mrs. William Thomas Tonner, 1964), Pennsylvania, PA. Courtesy of The Philadelphia Museum of Art. In Blake’s God Judging Adam (c 1795), both figures sport long, flowing white hair and beards, which appear to be markers not so much of their ages or identities, but of the ancient nature of the events. Henry Fuseli (1741–1825), Tiresias Appears to Ulysses During the Sacrifice (1780-85), watercolor and tempera on cardboard, 91.4 × 62.8 cm, Albertina, Vienna, Austria. Wikimedia Commons. Long white hair and beards are of course a long-established tradition in visual art: here is a contemporary example of Tiresias, the blind prophet of Apollo at Thebes, in Henry Fuseli’s Tiresias Appears to Ulysses During the Sacrifice (1780-85). Fuseli was Professor of Painting at the Royal Academy, and a great influence on Blake. Characteristic of the figure of Urizen in The Ancient of Days is the unusual way in which the figure’s hair and beard stream as if in a very strong wind, the figure’s nakedness, and its posture. 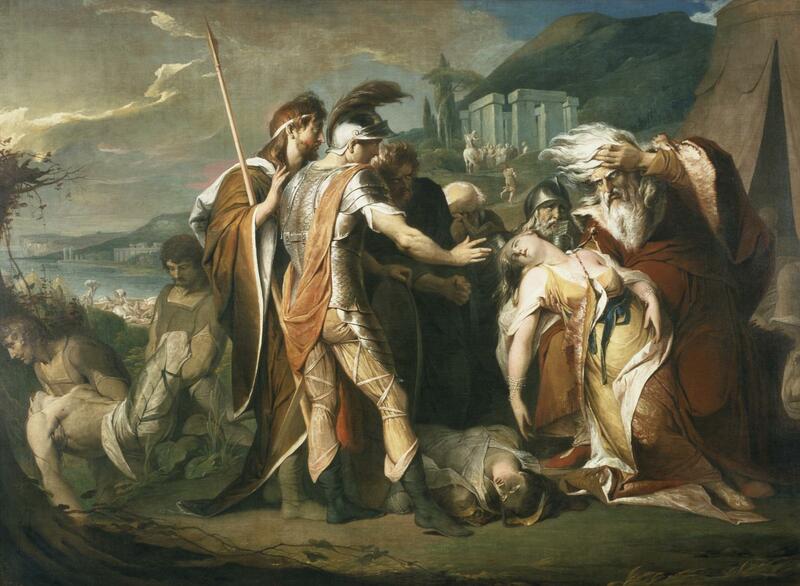 This can be traced most immediately to a major work by another contemporary painter who was highly influential to Blake: James Barry’s King Lear Weeping over the Dead Body of Cordelia (1786–8). 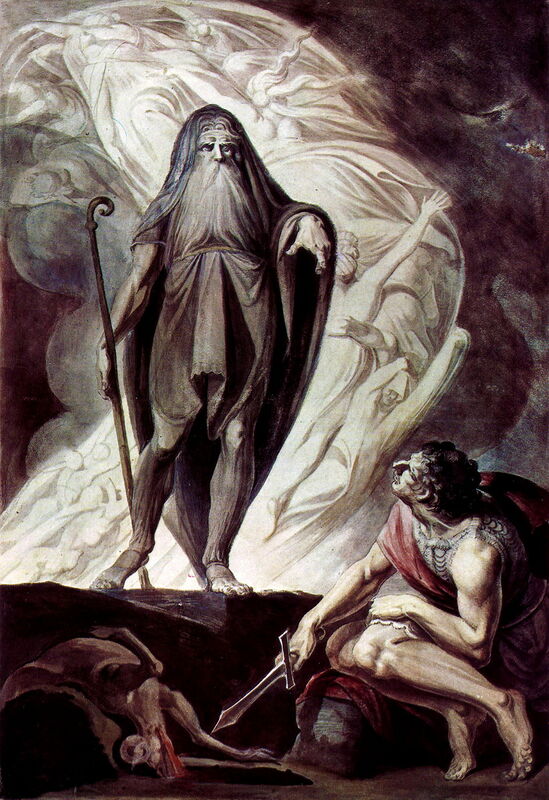 Barry was also Professor of Painting at the Royal Academy, and the similarities between King Lear’s white hair and beard here, and those of Blake’s Urizen in The Ancient of Days, are striking. 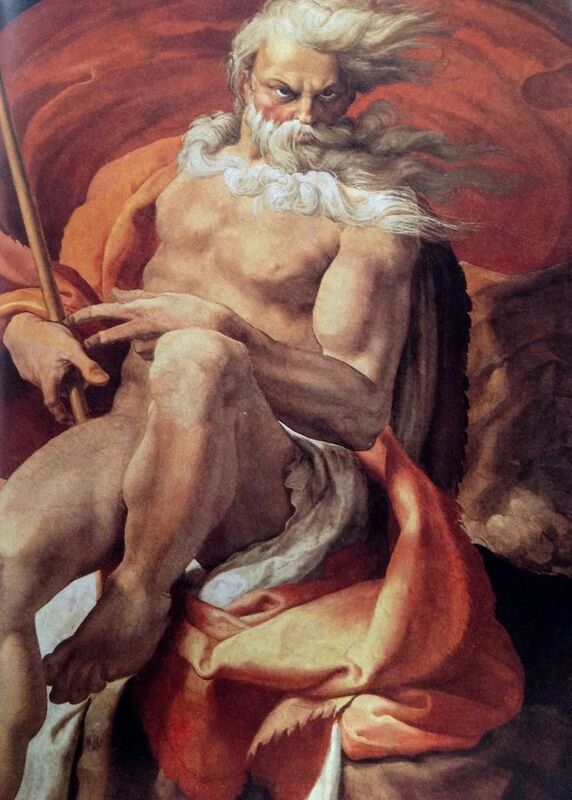 Blunt found another potential source, in Pellegrino Tibaldi’s figure of Neptune (1549-51) in his fresco showing the story of Ulysses in the Palazzo Poggi. Although now relatively obscure, Blake saw fresco as being ‘true’ art, and was long an enthusiast of frescos, even if he saw hardly any. 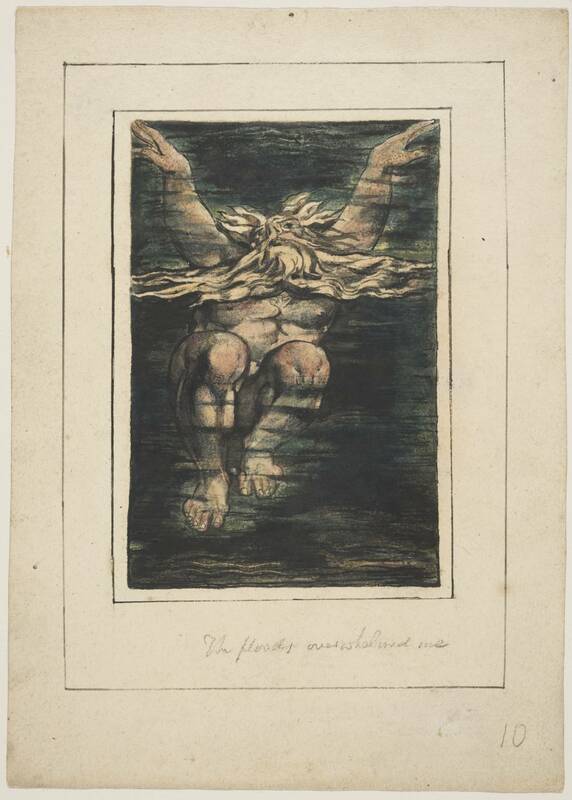 At the time, a quite popular book of prints of frescos included an engraving of Tibaldi’s Neptune, so this image would have been accessible to both Blake and Barry. 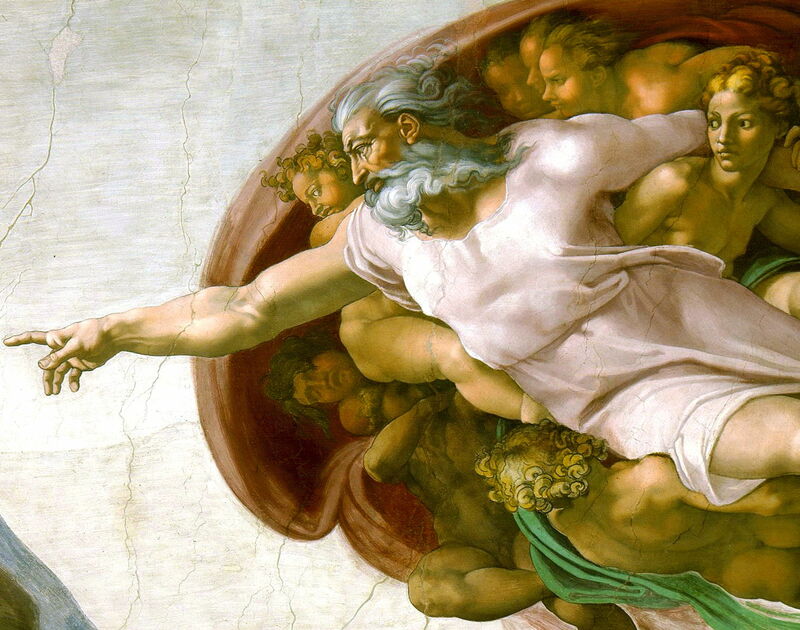 Michelangelo di Lodovico Buonarroti Simoni (1475–1564), The Creation of the Sun and Moon (detail) (1511), fresco, 280 × 570 cm, Cappella Sistina, The Vatican City. Wikimedia Commons. It is likely that Tibaldi’s Neptune was itself a reference to Michelangelo’s earlier frescos in the Sistine Chapel: the detail above showing God creating the sun and moon, and even more important that below showing the creation of Adam (c 1511). Michelangelo di Lodovico Buonarroti Simoni (1475–1564), The Creation of Adam (detail) (c 1511), fresco, 480.1 × 230.1 cm, Cappella Sistina, The Vatican City. Wikimedia Commons. Blake knew both of these sections of the Sistine Chapel frescos well, having engraved them previously. 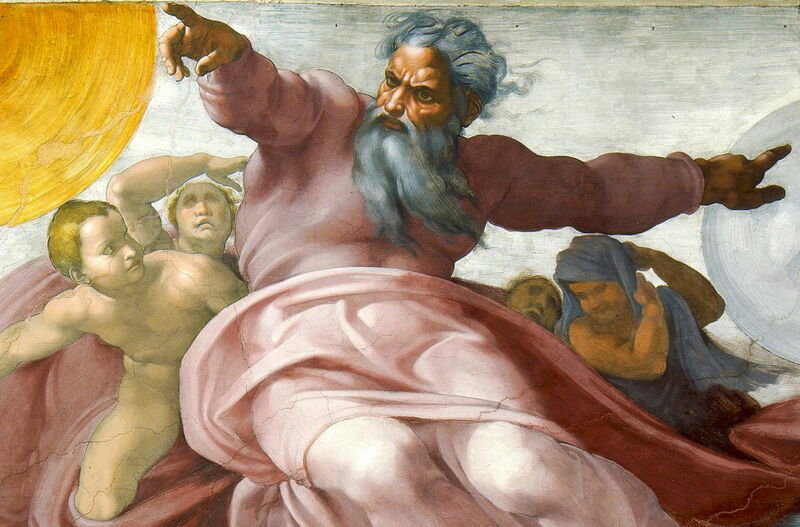 They also link to Blake’s own Elohim Creating Adam above. Blake’s Urizen the architect, seen creating the world using his compasses, is distinct from both God and Elohim in his nakedness. 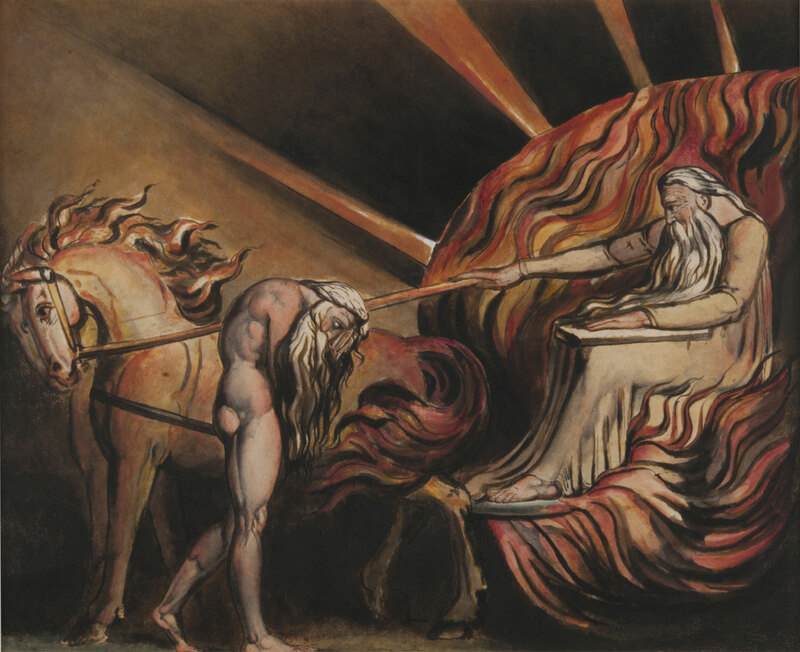 In Blake’s written narrative, the distinction between Urizen and Elohim becomes more blurred, when the former goes on to have the role of the jealous and vengeful god of the Old Testament, until his desire for dominion brings about his downfall into a state of Satan. It is often tempting to assume that, just because Blake’s paintings appear so original and different, that they originate entirely fron his own mind. However, Blake was just as prone to borrow from and refer to other visual art, and his paintings need to be viewed in that context. Blunt, A (1959) The Art of William Blake, Oxford UP. Butlin, M (1981) The Paintings and Drawings of William Blake, 2 vols, Yale UP. ISBN 978 0 300 02550 7. Damon, S Foster (2013) A Blake Dictionary, the Ideas and Symbols of William Blake, updated edn., Dartmouth College Press. ISBN 978 1 61168 443 8. Vaughan, William (1999) William Blake, British Artists, Tate Publishing. ISBN 978 1 84976 190 1. Posted in General, Painting and tagged Barry, Blake, Fuseli, Michelangelo, painting, Tibaldi. Bookmark the permalink. Scriptarian: Swift scripting for macOS?